In the WYE beneath him shining." Chapter VI. Approach to Haddon - Preliminary Remarks. "THE sun was fast declining in the "far west" when we attained the eminence near Haddon. 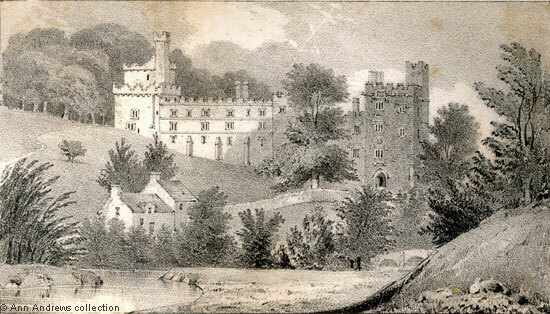 This relic of a bygone age, with its weather-beaten towers and battlements, we observed peering from amidst the thick foliage; its numerous turrets and windows gleaming in the sunlight; and being in part strongly shaded by its umbrageous envelope, it presented a fine object for the pencil. The situation of Haddon is pre-eminently beautiful. It stands on a shelving, and rather elevated, mass of the first limestone, overlooking the entire dale and its meandering and lovely Wye, backed by extensive woods and surrounded by majestic trees. At first sight it has more the appearance of an old fortress than what it really is, a Hall chiefly in the Elizabethan style, and without any effectual defences, as we shall presently see from the following remarks, which we beg to make while we contemplate this interesting structure ; - a structure which assisted the imagination of Mrs. Radcliffe in its wildest flights, when writing the Mysteries of Udolpho . Haddon is decidedly one of the finest specimens of a Hall of the olden time in existence. The old tower, with narrow loop-holes and gloomy uncomfortable rooms, is the only part which retains that stern character, the peculiar feature of that iron age when "every man's hand was against his fellow;" that age of darkness and military despotism which succeeded the destruction of the Roman power by the savages of the north. In these times, each successful conqueror parcelled out the nation or territory subdued, into so many military "fiefs," held only by virtue of devotion to their Prince, who claimed their services whenever circumstances required. These were again subdivided into smaller portions, to their dependants and retainers, who held their lands upon precisely the same tenure of doing fealty to their lord, and could be called upon at any moment to defend his person and domains from the aggression of a neighbour, or to proceed with him to serve their common chief, either at home or abroad. Europe thus became universally subject to military rule, which gradually softened, and settled down into what is termed the feudal system; a simple modification of this military despotism, with a somewhat less stern aspect, still retaining too much of its form and sanguinary character. * The bulk of the population, under this system, were no better than serfs of the soil, perfectly at the will of their masters, and plunged in the grossest ignorance and superstition. Surely it may be emphatically said of this period, that " darkness covered the earth, and gross darkness the people." This was a time of peril, when caprice, passion, ambition, or avarice, was the order of the day, and when either happened to be in the ascendant, pretexts were not long wanting to make an attack upon a neighbour to gratify a bloodthirsty desire, or accomplish any purpose of conquest or revenge, as the case might be. Can we wonder, therefore, that everywhere sprung up those gloomy, wretched abodes, those castles and fortresses which frown upon a country, surrounded by moats and defended with bastions, draw-bridges, and towers of immense strength. The times required it. No man felt safe a moment from the inroad of the foe. The old part of Haddon, which has elicited these remarks, is a specimen of the architecture of those times, and it is said to be older than the conquest; but this forms only a small part of (shall we say) modern Haddon. The first great quadrangle, and the three sides of the second, are built in the style of our ancient Halls - "a composite" - a combination of the Gothic and Saxon, without those powerful and gloomy defences, which were not so necessary in more recent times, when men became united, and subject to law, and one common form of government. Haddon, therefore, as a quiet country seat of our gentry in the sixteenth century, kept still in good repair, with all its ANCIENT honours about it, just as deserted by the family a hundred and seventy years ago; and really retaining all that character, as if they had quitted it but yesterday, is a beautiful specimen of that age. * The small Baronies and Baronial Courts and Manors are still existing relics, of these times, only shorn of their power". in the Earl's State dressing and bed-room" (Adam). 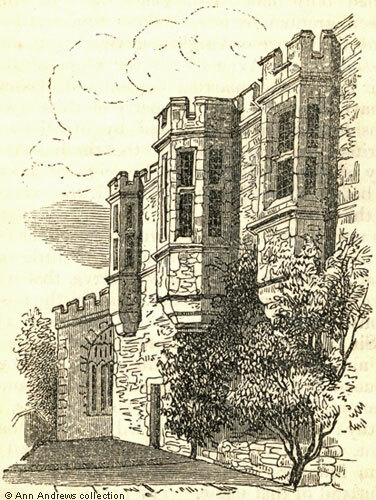 Lithograph of Haddon Hall and Rayner's sketch of the Oriel windows, with text from the book, published in: Adam, W. (1840) "The Gem of the Peak" London; Longman & Co., Paternoster Row. From the collection of and © Ann Andrews. Text OCRed and information researched, written by and © Ann Andrews. Intended for personal use only. Adam, William (1840) "The Gem of the Peak", London; Longman & Co., Paternoster Row - see onsite transcript. Radcliffe, Ann Ward (1794) "The Mysteries of Udolpho", London: Longman, Hurst, Rees & Orme. Jane Austen mentioned the book in "Northanger Abbey".